Please join Peter Beinart and Palestinian human rights defender Issa Amro for a discussion examining Israel’s 50-year occupation, life in Hebron, Palestinian non-violent activism, the fight to defend Palestinian human rights, and more. 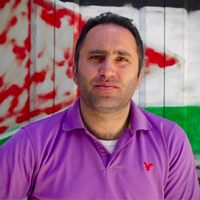 Issa Amro (@Issaamro) is an internationally recognized human rights defender in Hebron, Palestine. Nicknamed “the Palestinian Ghandi,” Amro is the founder and coordinator of Youth Against Settlements (YAS) – an organization working to strengthen the Hebron community’s steadfastness against the expansion of illegal settlements and document Israeli human right violations. YAS educates young Palestinians in nonviolent resistance through nonviolent action, media, and advocacy work and regularly receives groups of local and international activists, observers, and diplomats. In 2009, Amro won the One World media award for his involvement in B’Tselem’s “Shooting Back” campaign (using cameras to document abuses in Hebron). In 2010, Amro was named by the Office of the United Nations High Commissioner for Human Rights (OHCHR) human rights defender of the year in Palestine. In 2013, the European Union was Amor a Human Right Defender. Amro is currently the target of an Israeli military court indictment, involving 18 separate charges relating to his activism against the occupation, some dating back to 2010. The U.S. State Department’s annual report on Human Rights observed: “Human rights organizations stated Amro’s actions during these incidents were consistent with nonviolent civil disobedience, although military law prohibits them in the West Bank, including obstructing or insulting a soldier, participating in an unpermitted rally, and “incitement” (encouraging others to engage in civil disobedience).” Amnesty International has termed the charges “baseless” and stated that they are “solely related” to Amro’s work as a human rights defender. Amro’s next hearing in Israeli court is scheduled for late October 2017. In addition, earlier this month Amro was detained by the Palestinian Authority on charges related to his public defense of a Palestinian journalist and the right to free speech. Peter Beinart (@PeterBeinart) is a Non-Resident Fellow at the Foundation for Middle East Peace. He is also Associate Professor of Journalism and Political Science at the City University of New York, a Contributor to The Atlantic and National Journal, a Senior Columnist at The Forward, and a CNN Political Commentator. His first book, The Good Fight, was published by HarperCollins in 2006. His second book, The Icarus Syndrome, was published by HarperCollins in 2010. His third, The Crisis of Zionism, was published by Times Books in 2012. Beinart has written for the New York Times, the Wall Street Journal, the Financial Times, the Boston Globe, the Atlantic, Newsweek, Slate, Reader’s Digest, Die Zeit, Frankfurter Allgemeine Zeitung, and Polity: the Journal of the Northeastern Political Science Studies Association. The Week magazine named him columnist of the year for 2004. In 2005, he gave the Theodore H. White lecture at Harvard’s Kennedy School of Government. He has appeared on “This Week with George Stephanopoulos,” “Charlie Rose,” “Meet the Press,” “The Colbert Report” and many other television programs.